Due to the way Excel handles the calculation mode, the problem can easily be transferred to other workbooks, which can result in users issuing error-filled reports and quoting incorrect numbers. That’s also pretty bad, right! I’ve been caught out by this several times in the past, and I’m guessing that since you’re reading this, you have been too. To help alleviate some of this pain, I created the Calc Buddy Add-in. Hopefully, you won’t be caught out by this ever again. 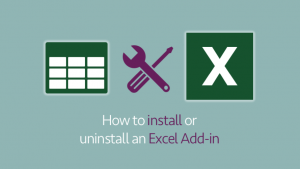 If you want to find out more about what causes Excel to work in this way, check out this post. 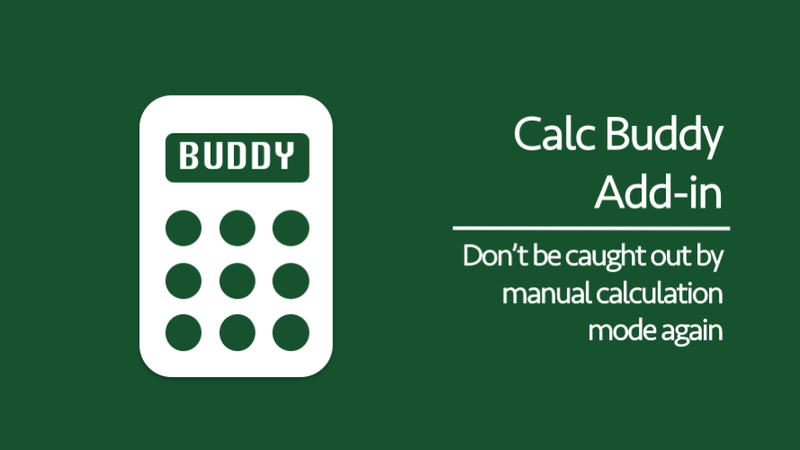 Calc Buddy allows you to select your preferred calculation mode. Then each time a workbook is created, opened or saved, the add-in will check to ensure the calculation mode it is still set the way you want. Calc Buddy does not take up a lot of space in the ribbon. It will only add a small button to the empty slot in the Calculation group of the Formulas tab. Use the tick box to enable or disable the warnings. Select your preferred calculation mode from the drop-down box, then click Save + Close. Now you know how it works, it’s time to download the Add-in. 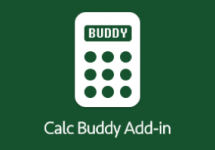 The Calc Buddy Add-in is available for newsletter subscribers for free. Existing newsletter subscribers can enter their name and e-mail address into the form below to download instantly. Or, if you are not a subscriber, you can enter your name and e-mail address below to become one. The Add-in is easy to install, just follow the pdf instructions distributed with the download, or follow the instructions in this post. Obviously, it would be better if this type functionality were built into Excel already, or even better if the calculation mode were applied at the workbook level. In the future, I hope this feature is added, and Calc Buddy will no longer be required. Until then, I hope you find it useful. Which versions of Excel does Calc Buddy work on? 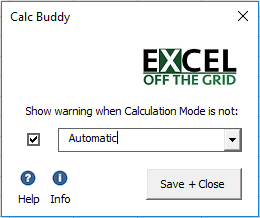 Calc Buddy should work on Excel 2007 and later for Windows., and Excel 2016 and later for Mac. On how many devices can I install Calc Buddy? Each license is on a per-user basis for an unlimited number of devices. Feel free to use Calc Buddy at home, at work and anywhere else you like. Can I share Calc Buddy with my friends and work colleagues? Just send them a link to this page and they can sign-up to get their own copy. If you want a site license for your entire team/business, please contact me to discuss. The help pages can be accessed from within the Calc Buddy Add-in itself, but can also be found here. Find the End User License Agreement here. Why does Excel's calculation mode keep changing? ← What is CutCopyMode = False? Should you use it?